In the first half of my Planning career I worked on a number of drinks brands and became a bit of an authority on stuff like maximising back bar selling hotspots. As a result, I ended up writing lots of features for drinks trade mag The Publican and still provide expert comment for the odd piece in The Morning Advertiser (who merged with The Publican). It’s only the brewing industry that seems to feel the need to target it’s NPD on the basis of gender. But women have been conditioned by the industry itself to look for a drink to suit the occasion, rather than their femininity. Women are more willing to order their own drink to suit the occasion, or invent one, with hundreds of variations on spirit-and-a-mixer. And that’s the point – everyone is an individual and you can’t market at the entire female adult population as some kind of homogenous sisterhood. Which is exactly what beers aimed at women seem to have set out to do. It seems that the drinks industry didn’t listen. We’re about to see the launch of Coco Breve, a ‘coconut water-infused clear malt beverage targeting women’, hot on the heels of last year’s Animee, a low calorie beer that comes in clear, lemon and rose – and only sold £300K worth in its first four months on supermarket shelves. Then there’s Carlsberg’s Eve, a lychee flavoured drink fronted by Louise Redknapp which failed despite massive marketing spend. 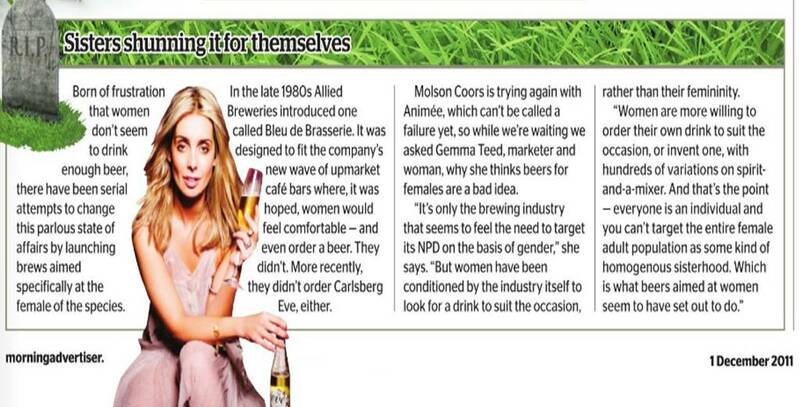 There’s a great piece from last year by Melissa Cole in The Guardian about why she thinks beers aimed at women fail. Only 17% of beer in the UK is drunk by women so it’s clear why brewers see an opportunity. But they still seem to be hell-bent on producing a brand to fit a demographic rather than a mindset and/or needstate.